WMATA’s Metrobus, the sixth busiest bus agency in America, provides more than 100 million trips per year in the District of Columbia, Maryland, and Virginia. New Flyer will deliver up to 694 heavy-duty Xcelsior® transit buses (or 788 equivalent units) to the Washington Metropolitan Area Transit Authority (WMATA) as part of a five-year contract award. The contract will be comprised of 40-foot compressed natural gas (CNG), 40-foot clean diesel, 60-foot CNG, and 60-foot diesel heavy-duty transit buses to support WMATA’s goal of reducing greenhouse-gas emissions, and further deliver on high-capacity WMATA routes, with the 60-foot buses offering 115-passenger capacity. 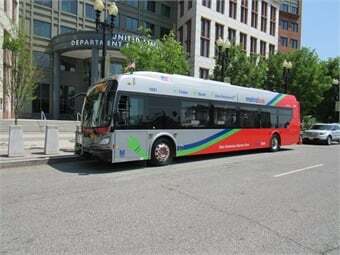 Funding was supported by Federal Transit Administration (FTA) grants. WMATA’s Metrobus, the sixth busiest bus agency in America, provides more than 100 million trips per year in the District of Columbia, Maryland, and Virginia. Since 2001, New Flyer has delivered nearly 1,400 buses to WMATA, with propulsions including electric hybrid, zero-emission battery-electric, and low-emission CNG.